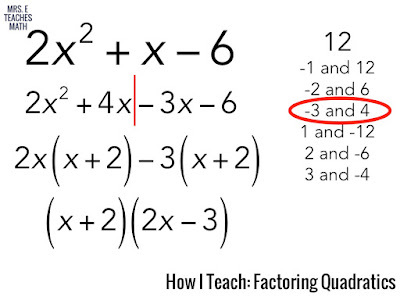 I know of a few different methods people use to teach factoring, but I’ve never been a fan of the “fancy” methods. They just don’t work for me. When I teach factoring, I actually teach the unit backward. I teach factoring by grouping, factoring trinomials when a≠1, factoring trinomials when a=1, then special cases. 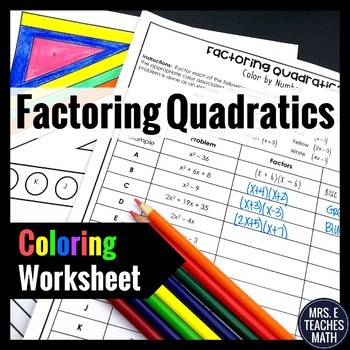 I start with factoring by grouping, because once students can do that, factoring trinomials is easy. 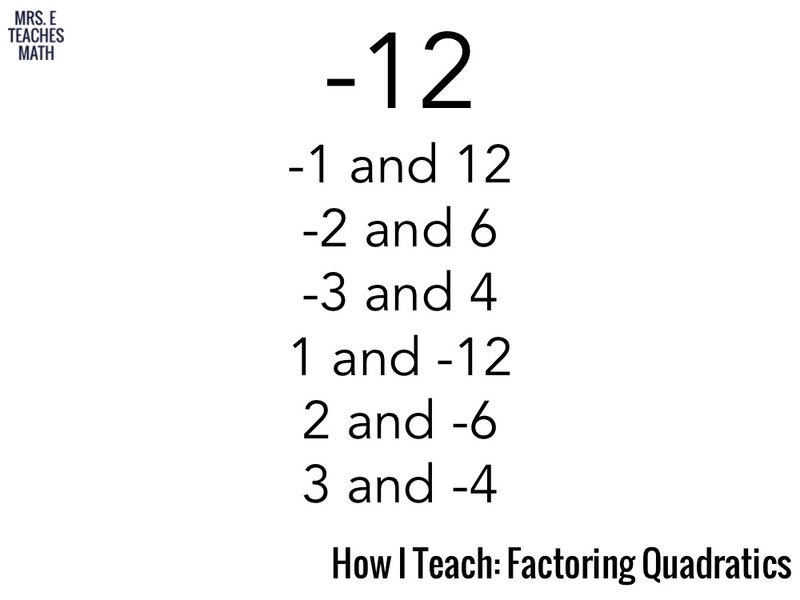 I tend to spend an extra day teaching factoring by grouping. 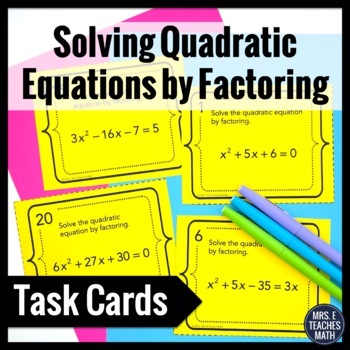 When students have that down, I move on to factoring trinomials. 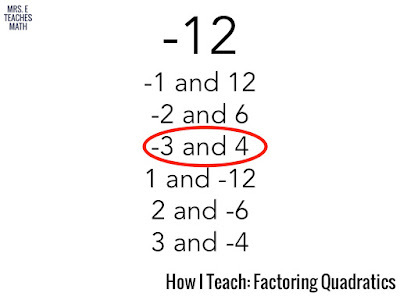 I prefer teaching when a≠1 first, because when a=1 is really just a special case. If students can handle the “harder” version, there almost isn’t a need to teach the “easier” version. 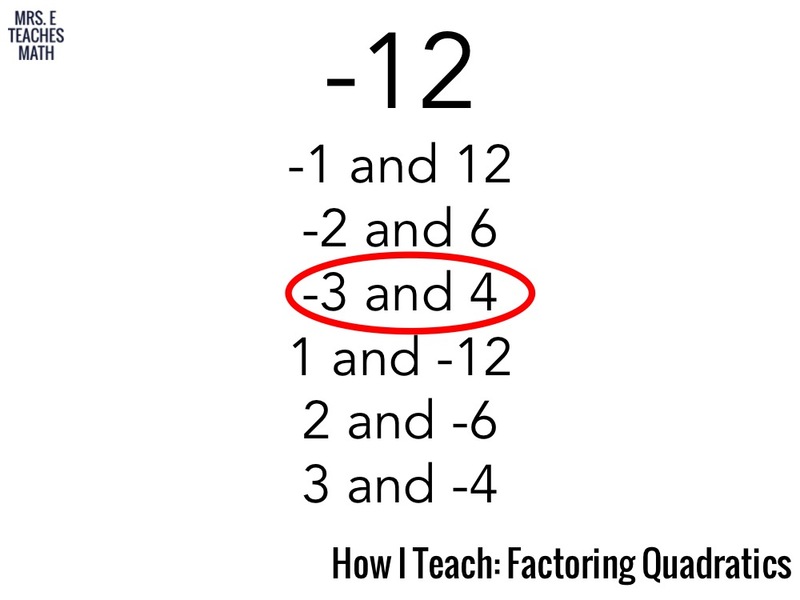 So, this is how I teach factoring. This is not revolutionary. It is not new, or even interesting. But it works, every time. I've often heard this method called "splitting the middle". First, I have students multiply the “a” value by the “c” value. Then, I tell them they are looking for two numbers that multiply to that value. I have them make a list. Only after that do I have them find the pair of numbers that adds to the “b” value. 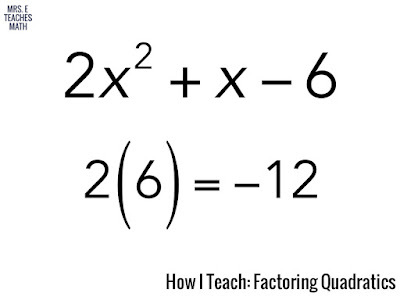 I prefer to teach factoring this way because it doesn’t rely on tricks and it works every time. Also, after this lesson, teaching a=1 is just a special case. 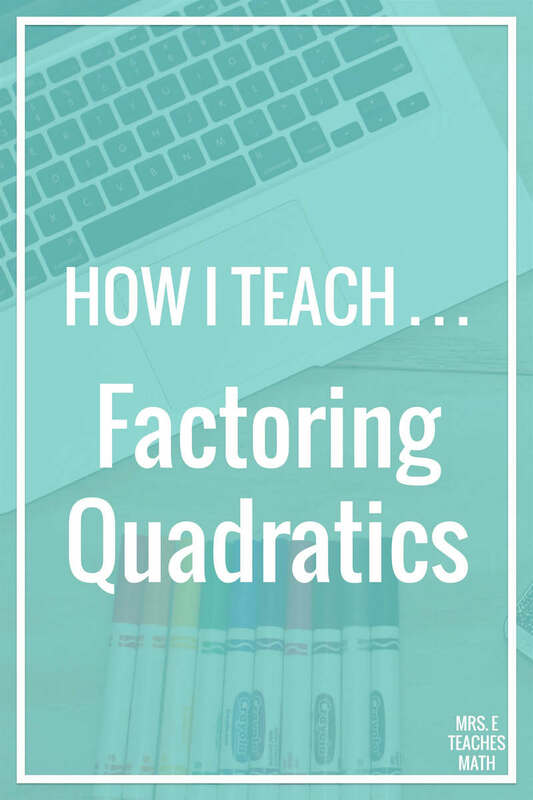 I use the same method when teaching factoring, although I LOVE that you teach the a=1 case after because I always have a student or two who get confused between the two strategies. I think that would help a lot. Thanks! I do this in a similar manner, but when I have them do the factor by grouping I have them put it into an area model. The graphic organizer helps them to see where the common factors are. It works for solving quadratics where a is not 1 as well as cubic expressions that can be factored by grouping. 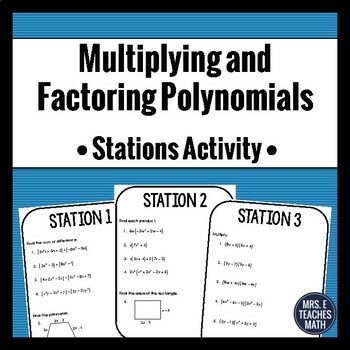 It's also a method I teach to multiply polynomials for those who need their work to be more organized than just distributing. Great strategy. I enjoy the hands on method of teaching quadratics using Mortenson math blocks. I had some of my own personal "ah, ha" moments playing around with quadratics. I teach special education students and use this same method, in the same order. Your'e right. It works every time. I find I rarely have to teach a=1 because they don't see it as any different. When you multiply a*c, it doesn't matter if a=7 or a=1. 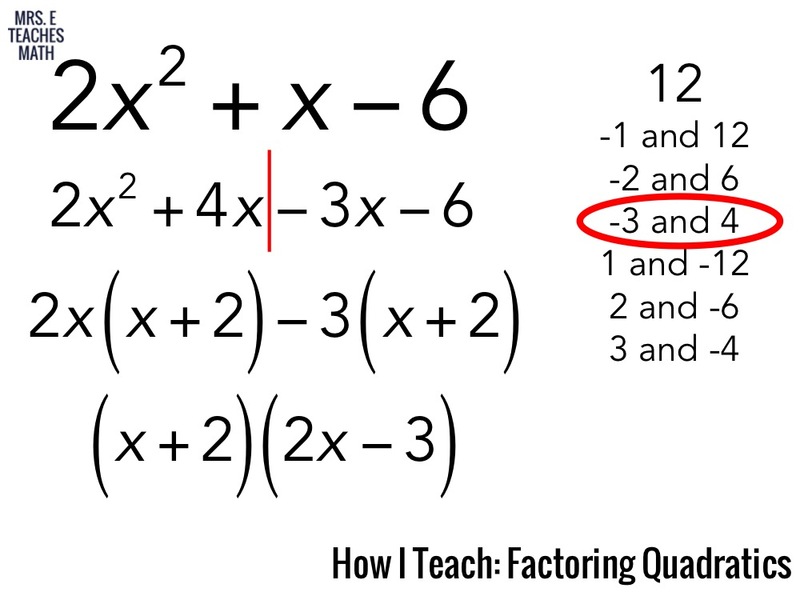 Over (too many) years of teaching, I have seen and used numerous techniques to factor quadratics (from guess-and-check to box-method) .... this is my favorite and the most easily understood. I'm a bit confused though. How you would you go about it if it was 4b^2-25? Add a zero placeholder; it still works (for simplicity/clarity I used "x" instead of "b"). I use the phrase...we are looking for TWO KEY NUMBERS that multiply to "ac" and add to b. BUT my question is, when a=1, do you still have the students break bx into 2 separate terms and using grouping method or do you teach them a shortcut and go right to the factors (x___)(x___) ? In the past, I have not shown my students this little shortcut until a few of them discover it on their own. I don't teach the shortcut. Many of them figure it out for themselves, and that's fine. However, the students that don't figure it out on their own are typically the students that need a little more practice anyway. So glad to find someone else who skips a=1 at first. It helps students immensely! Can someone comment on why we labor to teach this algorithm? I'm at a loss to know why. In my opinion, I try to teach several methods to students and allow them to pick the one that makes most sense to them. I do also start with leading coefficient not equal to 1 so that those problems do not seem like the special circumstance. As far as the proof of the grouping method not being accessible to students, I don't try to prove it with students, rather I focus on helping them see that the pattern does exist by looking at several examples. (Like the converse part of the article you referenced but with actual number and not as abstract) I find that this is accessible to students. 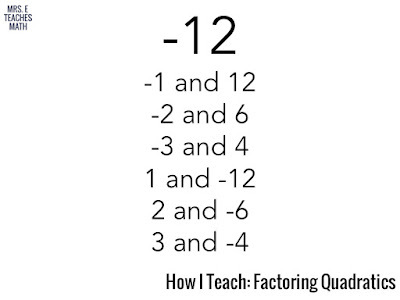 Do you believe that we do not need to teach students how to factor or just that we shouldn't use this algorithm? So when do you teach them how to pull out a GCF before they do the grouping? Like if the above equation started as 4x^2+4x-24. What would you do with that?